Arizona State University researchers have made an unexpected discovery by studying the atomic structure of nanodiamonds. The new results simplify the names for nanodiamonds. More important, they reveal unseen and unpredicted structural complexity in the tiny diamonds. Nanodiamonds are those with a size smaller than one millionth of a meter, or 0.000039 inch. To put this in scale, many billions of them would fit on the head of a pin. In recent years, scientists have identified various kinds of nanodiamond structures and gave them "alphabet names" such as h-diamond, i-diamond, n-diamond, and so on. Ordinary diamonds, such as those used in jewelry and industry, have a cubic structure that scientists designate as c-diamond. "We discovered that the alphabet soup of nanodiamond types contains, in reality, just ordinary cubic diamonds, but they have undergone twinning," says Péter Németh, the lead author of a paper published December 16 in the Nature journal Scientific Reports. Németh, who is now in the Institute of Materials and Environmental Chemistry at the Hungarian Academy of Sciences, is a former postdoctoral scholar with another of the paper's authors, Peter Buseck, Regents' professor in ASU's School of Earth and Space Exploration (SESE). Laurence Garvie, the curator for the Center for Meteorite Studies and a SESE research professor, is the paper's second author. Twinning is a natural process occurring in crystals that divides them into extremely small regions of symmetry-related structures. The twinning gives the nanodiamonds a complexity that has tricked scientists into classifying them as several entirely different structures. "Think of shingles on a roof," says Buseck. "They're all identical, but those on either side of the roof peak have a symmetrical relationship to each other." Many types — or just one? Diamonds consist of carbon, an essential building block of life and among the most useful and versatile chemical elements. Even when pure, carbon occurs with a number of different structures. Well-known forms include ordinary diamonds (used for jewelry and abrasives), graphite (lubrication), and fullerenes, sometimes called "buckyballs." Less known to the public, in recent years scientists have described additional nanosize forms of carbon as diamonds using an "alphabet" naming scheme. "Alphabet" nanodiamonds have the standard diamond characteristic that each carbon atom has its four nearest carbon neighbors arranged in the form of a tetrahedron. However, researchers have reported that the 3D arrangements in these nanodiamonds differ from those of normal c-diamonds. 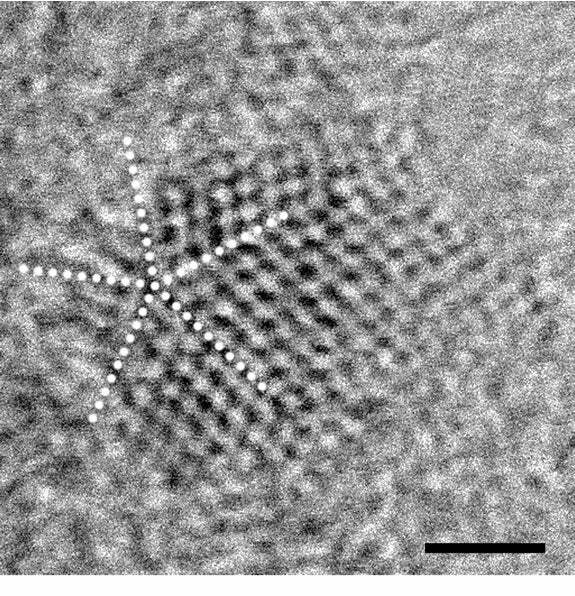 To get to the bottom of the matter, the ASU team used the ultra-high-resolution electron microscopes in ASU's Center for Solid State Science. "We selected several synthetic and natural nanodiamond samples," says Garvie. "And we uncovered a complex diversity of structures that are all based on the normal cubic diamond structure — but with lots of twinning." In short, the nanodiamond alphabet doesn't exist. The new results show that twins are ubiquitous in nanodiamonds and can produce surprisingly diverse structural complexity. When examined at the atomic level, the structures are, intriguingly, both simpler and more complex than expected. Simpler because they consist of regions of normal diamond, and more complex because they contain infinitesimally small regions of twinned atoms with different orientations. "The high density of these tiny regions significantly affects their mechanical, electronic, and optical properties," says Németh. "We're just beginning to see where these newly discovered structures will take us."